Win Over Winter With This Simple DIY Beef Vegetable Soup In A Jar Gift Idea. I don’t know about you, but I am ready to tackle winter before it even starts. Winter and I have a love-hate relationship. There really is so much to love about the season like the snow, a warm fire, and snuggling under a lot of blankets with a nice cup of tea. There is also a lot to dislike as well. I start out enjoying the cold weather but that quickly fades as the cold and snow continue, making it feel like winter will never end. The cold weather can also bring on sickness. Usually, that means when one family member gets sick, our entire family does eventually. That is why I like to be prepared to win over winter. Winter wellness is so important. MOTRIN® IB, Children’s MOTRIN® and Extra Strength TYLENOL® are products that help fight seasonal illness. Motrin IB® temporarily relieves minor aches and pains due to: the common cold, headache, backache, minor pain of arthritis, toothache, muscular aches, premenstrual and menstrual cramps; temporarily reduces fever.For adults and children 12 years and older. Use only as directed. Children’s Motrin® helps your kids bounce back by relieving their pain or fever. Use only as directed. It is available in Bubble Gum, Grape, and Berry flavors. Now that the holidays are here, I like to give the gift of wellness to family and friends. 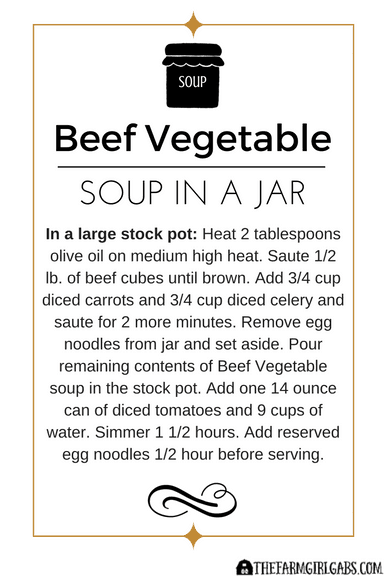 This Beef Vegetable Soup In A Jar Gift Idea is simple to put together and makes a great gift idea! I like to think of it as a Winter Toolkit. 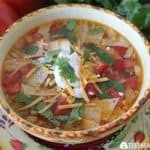 Soup soothes the soul, especially when you are feeling under the weather. This gift idea is a perfect way to ensure your friends and family are prepared if sickness arises. As you probably know by now (only because I have mentioned it a million times), I love mason jar crafts. They are creative and fun! Guess what? You will need a quart-sized mason jar for this project. Chances are you may have some of these ingredients in your pantry too, which makes this gift so easy to assemble. Start by adding a layer of the onion soup mix, then the split peas, quick cooking barley, seasoning, and lentils. Top it off with noodles. I then cut a piece of fabric to fit the lid. Attach one of the direction labels to a piece of string and tie it around the lid. Easy peasy! No baking or cooking involved in this simple gift in a jar idea. You can download and print the labels by clicking the image below. To assemble the gift basket, I included the Beef Vegetable Soup In A Jar, diced tomatoes, a soup ladle, MOTRIN® IB, Children’s MOTRIN® and Extra Strength TYLENOL®. Nestle is all together with a pretty napkin. You can find Motrin IB®, Children’s MOTRIN® and Extra Strength TYLENOL® in the pain relief aisle at Target. You can also pick up all the other ingredients you need to assemble your jar there as well. I will definitely be gifting this Beef Vegetable Soup In A Jar gift to my family and friends this holiday season. A gift like this is the perfect way to Win Over Winter! This Winter Toolkit will help everyone stay ahead of winter illness with Motrin IB® and Children’s MOTRIN®.